When other conditions are correct, the rate of photosynthesis doubles for each 10 deg C (18 deg F) rise in temperature. This principle applies within the 10-30 deg C (50-86 deg F) range for temperate plants and 15-35 deg C (59-95 deg F) for tropical plants. When growing in an enclosed area such as a grow room or greenhouse, air temperature is commonly controlled via artificial heating, ventilation or fogging. Day time: The optimum daylight temperature is around 25OC (77OF). Never allow the temperature to exceed 30-35OC (86-95OF) otherwise “photorespiration” can occur. This results in the wasteful destruction of sugar supplies, which slows growth rates. When the temperature is too low (i.e. below 25OC / 77OF), the rate of photosynthesis and respiration will be suppressed. This will restrict essential plant processes and growth. 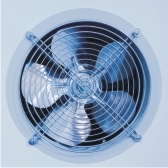 Low temperatures can also cause humidity to increase to levels that can promote disease problems. Cold leaves will suppress transpiration rates which in turn restricts nutrient uptake. Translocation is also a lot slower when the temperature is below optimum which causes systemic agents (e.g. foliar fertilizers) to act slower. Night time: The respiration rate needs to be suppressed at night by allowing the temperature to drop to at least 20OC (68OF). “Day time” respiration rates are wasteful at night because less ATP energy is required. ATP energy is the product of respiration. During the day time, more ATP is required for processes such as downloading sugars and nutrient uptake which occur during photosynthesis. Plants do not photosynthesise at night which means less ATP energy is needed. Because plants cannot store ATP, any excess that is produced is wasted.